The roll back of the cutbacks continues. 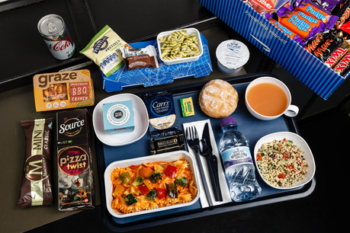 British Airways announced some fairly substantial changes to World Traveller (long haul economy) catering yesterday, albeit that the changes simply restore the existing position from a couple of years ago. Among other things, ice cream is back and you will once again receive a full bottle of water rather than the tiny ‘cuplet’. The press release is concise and clearly written so I will simply reproduce it in full. My thoughts are at the bottom. The first flight with the new catering will be the BA117 from Heathrow to New York JFK departing at 8.25am on 17th January. I’m not sure about you, but I was staggered to discover that “Our customers tell us that when they’re taking a long-haul flight, great food and beverages make a real difference to them”. On the other hand, two years ago apparently customers told BA that they would prefer lower economy fares via cutbacks in food and drink offerings. You just can’t trust what those pesky customers say, it seems. To be serious, though, this does seem very positive. It also implies that there will be no move to long-haul ‘buy on board’ catering, at least for a couple of years. We will know if it has worked if BA’s Net Promoter Score (basically BA’s preferred method of calculating customer satisfaction) starts being reported again in investor presentations! The problem is that good news makes a more boring press story than bad news so these changes are likely to take longer to filter through to the general public than the news about the cuts. We try to be even handed on HFP but I doubt this press release will get a half page in the Daily Mail. The climb back up the hill will take a lot longer than the slide down. I wonder if the response to our ‘win two Economy flights to New York on the airline of your choice’ competition would have been different if it had launched this week. You still have 48 hours to enter that, by the way – click the link. Things are picking up though. Next stop – an overhaul of Club Europe food in April …. “Those on longer daylight flights to destinations such as Cape Town and Hong Kong”….I guess whoever wrote the press release doesn’t fly much longhual as both of these flights are overnight both ways. I guess they meant place like Bangkok and Las Vegas? I flew to NY on Iberia and cannot begin to express how surprised I was at the difference in quality of service between Iberia and BA (with Iberia being better), the ACruz impact has just made BA such a dry unhelpful experience that I am glad they reeling back in some of this overreaching economisation. Surprised about giving out magnums , is scared to eat one of them on my couch the way the chocolate shatters off when you bite into them . Imagine all them chocolate shards melting into the seats and carpet ! But why “bottles”? Extremely wasteful unless they can assure they’re all recycled. In what other sealable vessel can water be provided? I think part of the idea with the cuplets was that fewer people would need the loo – less water/soap/paper towel usage, less wear and tear on the flush mechanisms and door locks. More $aving$. Of course! How could I miss it! Better yet, let’s just get people to use their food napkins when they go to the loo instead of toilet paper, that way we can do away with paper towels entirely! They could pick them up and then put them in a bag for recycling or even mixed recycling. I had a moment of panic when I couldn’t see anything about the ‘pizza wraps’ I’ve had on west coast flights – but thankfully they are still there further down the page. phew! Only applies if I HAVE to fly with BA to the west coast again though… unsurprisingly I’ve taken 8 out of the last 10 flights with Virgin! Bottles are voluntary, if you want just a cup I’m sure you can still get it. Stoked for bottles and hope they have a self service refill method on board. Snacks at the back galley are also a good idea. Out of interest in economy on long haul BA how many free alcoholic drinks are you entitled to? I’ve had flights where I’ve had 4-5 of the mini wine bottles, 2-3 G&T’s and more… just go up and ask for it, or ask for extra when they bring round meals (usually have wine on the same trolly). Really depends on the crew though, some get funny, some are fine with it. I flew to ICN on Monday – no cuplets of water, but rations of mini-bottles of Highland Spring were available. Hong Kong airport confiscate any bottles of water you buy in the airport. True for flights going to Oz ex HKG. Direct flights to the EU (including the UK) do not have supplementary security checks post border (passport control) and boarding the aircraft so any food/liquids purchased airside are not confiscated. I really dont hnderstand this in out dance with the pretzels, this must be the 4th or5th time theyve been taken away and then added back! Wow – so BA is rolling back to a minimally acceptable standard for economy passengers and positioning it as a huge investment…do they really think us customers are that stupid? When my 6 month pregnant wife flew economy long haul 1 year ago LHR-IAD and told me she didn’t get any food between the initial meal service and landing I was utterly disgusted. Now Cruz has decided to put a few things back in place and positions it as a massive positive investment? Wow. Compare this economy offering to the Middle East airlines or Turkish and then decide whether it is competitive. If competition rules allowed it would be great if BA were acquired by Emirates or Etihad and Walsh/Cruz were replaced by leaders who understand customer service.